Snowdon, or Yr Wyddfa to use it’s Welsh name, stands at 1085 metres and is the highest mountain in Wales (and England). Its rugged beauty attracts tens of thousands of visitors every year, mainly walkers and climbers. 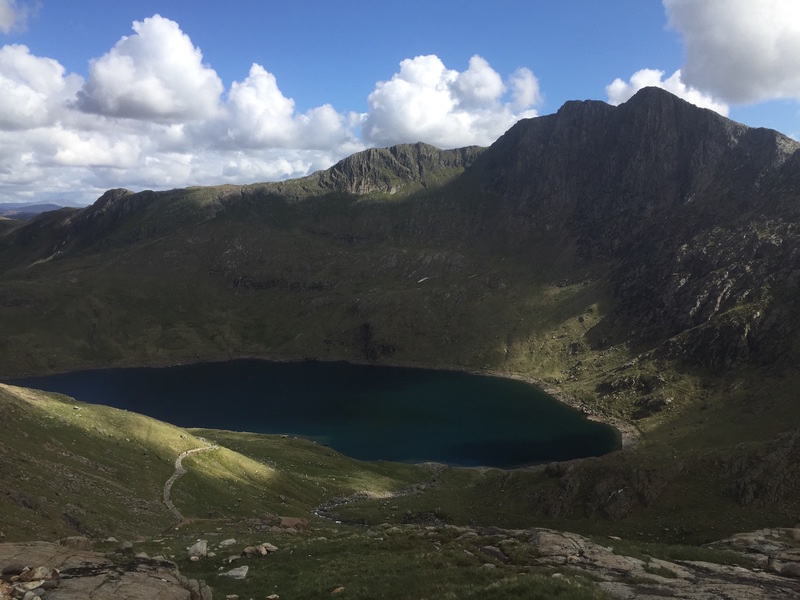 Located in the Northern area of Snowdonia National Park, Snowdon sits proudly in the centre of the stunning Snowdon Horseshoe surrounded by Lliwedd (898m/2946ft), Garnedd Ugain (1,065m/3494ft), and Crib Goch (921m/3022ft). The mountain is designated as a national nature reserve for its rare flora and fauna, some of which such as the ‘Snowdon Lily’ is found nowhere else in Britain. 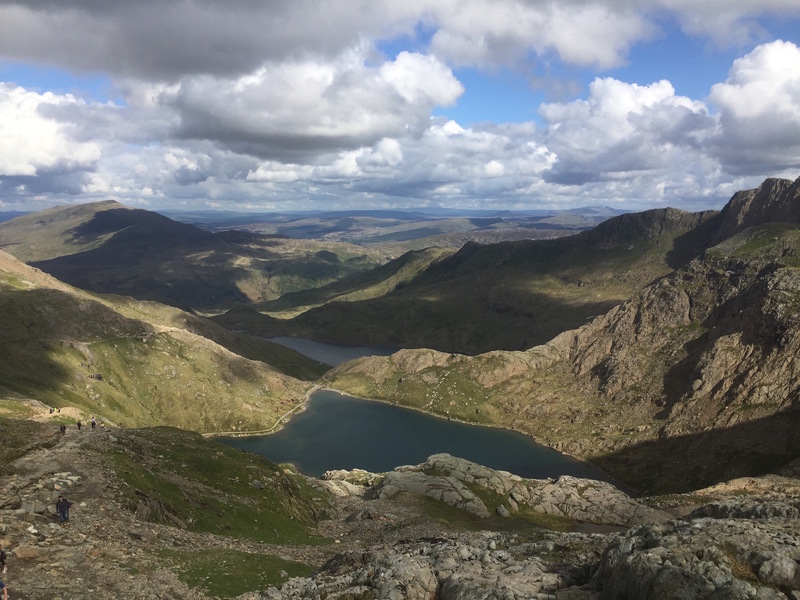 The summit offers some of the best views in Britain, from the nearby lakes, valleys, cwms and mountains of Snowdonia out to the Welsh coast line. On a clear day you could be lucky to see as far as England, Ireland, Scotland and the Isle of Man. On some days Snowdon can appear to have it’s own climate which can change unpredictably. Temperature at the summit can be 10 degrees colder than the villages below. 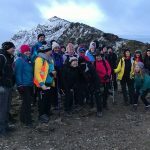 Although the paths to the summit are well established we would always advise that you go with a guide, or at the very minimum a member of the group is experienced in mountain walking, has first aid experience and a good knowledge of navigation skills, particularly in winter. You should also check out our Training Plans and Kit Lists before you go! See here for information on Guided Walks. There are 6 main paths which take you to the summit, each with their own uniqueness. You can read a little bit about each path here, along with a couple of others we thought you might enjoy. The Miners Track was originally built to serve the Brittania Copper Mine and you will pass some of the mine ruins on the way. Leaving Pen y Pass and climbing steadily the path is easy going and well maintained. Views are stunning from the off set along Gwynant Valley, Llanberis, Llyn Llydaw and Crib Goch. As you follow the path the Snowdon horseshoe comes into view. The path crosses Llyn LLydaw before taking a steep climb zigzagging up towards Bwlch Glas, meeting with the Pyg Track. Once we meet the Pyg Track the route starts to climb steadily and for the last few hundred metres we follow the route of the Llanberis Path with the summit in your sights within about half an hour. The Pyg Track is the shortest route up Snowdon but certainly not the easiest with steep and rocky sections. As the path leaves Pen y Pass you will climb steeply over rough and rocky terrain. On a clear day the views are fantastic over the Glyderau Range and Llanberis Pass. Above you will see the knife edge arete that is the famous Crib Goch above you. The route follows Bwlch y Moch (pass of the pigs) and climbs steadily above the glacial lake Llyn Glaslyn. At this point you will head towards the summit which is in full view towering 500m above the lake. Towards the summit the path become uneven and exposed and should not be attempted in winter conditions. The Llanberis Path, although the longest, is thought to be the easiest of the 6 main routes. The path (although starting with a steep tarmac section which isn’t the best introduction to the mountain) climbs steadily uphill following the mountain railway. Paths are good all the way to the summit and suitable for anyone with a reasonable level of fitness. Stunning views are some consolation for the path getting steeper, more uneven and more exposed as you get further towards the summit. There are some rocky areas which can be quite hard going on the descent so a good pair of walking boots is required. The exposed section towards the summit should not be attempted in winter conditions without the correct equipment. The Watkin Path is the longest on the main routes to the summit of Snowdon. This path was originally opened in 1892 by the then Prime Minister William Gladstone and was the first designated footpath in Britain. 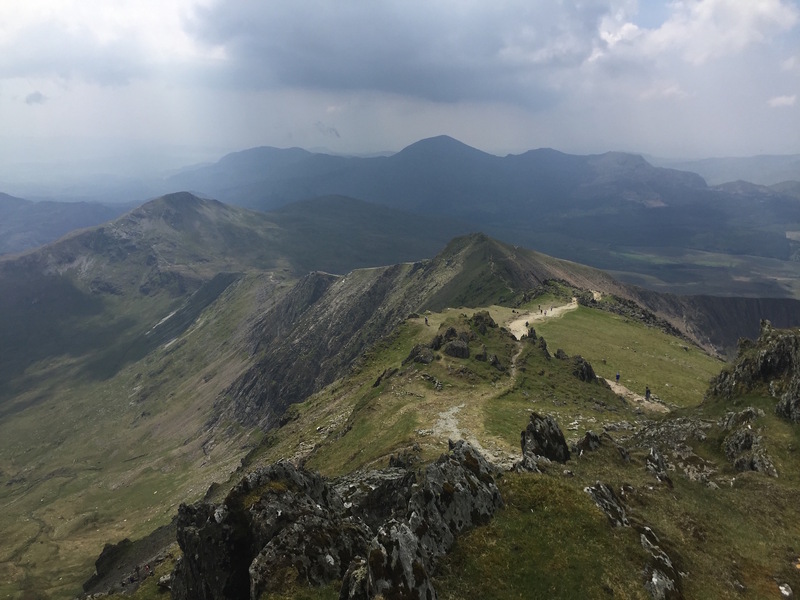 The path is named after Sir Edward Watkin, Liberal Member of Parliament and a railway entrepreneur who was responsible for creating the path from the South Snowdon Slate Quarry near his summer home. One of the most scenic routes with lots to see along the way, even if visibility is poor you can enjoy the waterfalls, old quarries and ruins. The path starts off fairly easy to follow but once you reach around 700 metres became somewhat harder to navigate with some scrambling involved and a couple of large, unpredictable and steep scree sections. Rhyd Ddu path is the quietest and least visited of the main Snowdon routes. The path starts in Rhyd Ddu and takes a gradual start along the old slate quarry track where from the start you will enjoy views of Moel Hebog and the Nantlle Ridge (don’t forget to look behind you!). The route continues on a good path before taking a steeper route over rocky terrain to the Llechog Ridge. From here the route goes over some loose scree then follows the exposed ridge of Bwlch Main, one of the narrowest ‘walkable’ ridges in Snowdonia to the summit. This route can be combined with the South Ridge, our favourite route which has a few more scramble sections. Find details on our Snowdon Rhyd Ddu and South Ridge dates here. The Ranger Path is one of the quieter routes to the summit of Snowdon. Thought to be one of the earliest it was used to carry copper ore from the Britannia Copper Mine up the eastern side of the mountain. 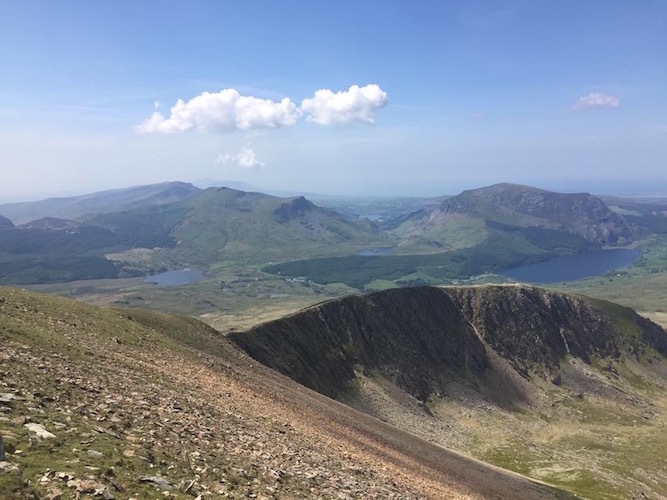 The path was named in English after a mountain guide called John Morton who called himself the ‘Snowdon Ranger’ and would guide visitors to the summit of Snowdon along this path. Starting at Llyn Cwellyn the path zig zags quite steeply around Moel Cynghorion, Blwch Cwn Brwynog and over Clogwyn Du’r Arddu with stunning views of Llechog ridge and Cwm Clogwyn. The path then joins the Llanberis Path on to the summit. 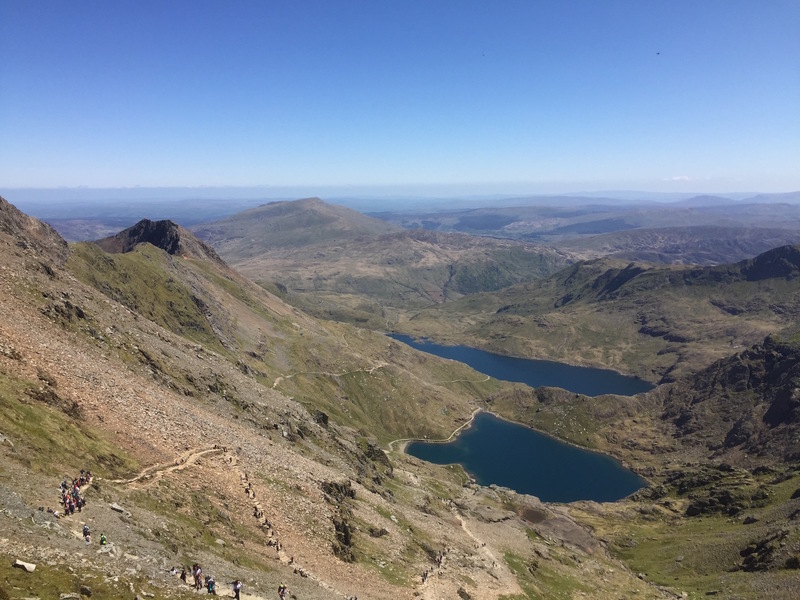 The Snowdon Horseshoe is considered the greatest all day scrambling route in the UK. Taking in Snowdon, Y Lliwedd and the mighty Crib Goch it is not for the faint hearted and should be avoided by anyone with a fear of heights or who is not properly equipped or experienced. You will be rewarded with amazing views all day, but you may be too busy concentrating to notice them! 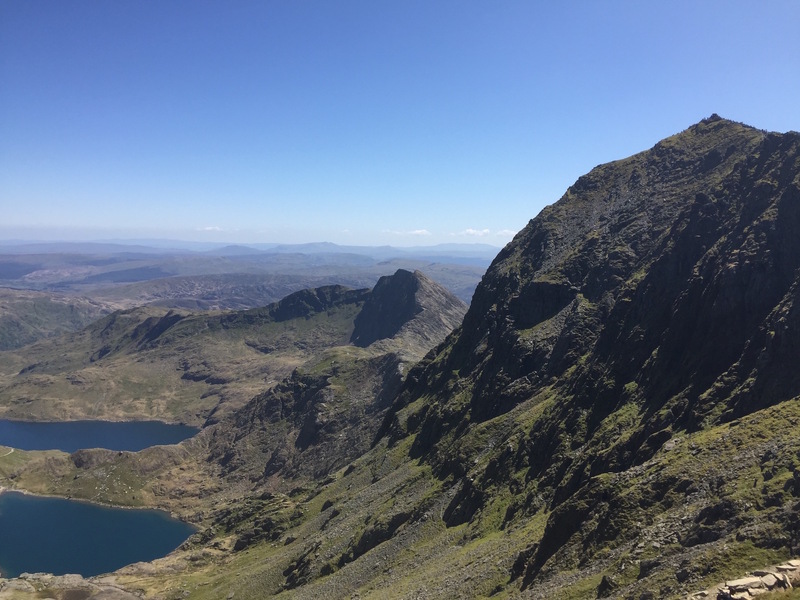 The route follows the Pyg Track from Pen y Pass going off to the right (you will see the ‘warning’ signs on the stile) to Crib Goch where a steep scramble will take you up to the summit and then across the 900 metre high knife edge ridge. From here more scrambling and the eastern ridge of Garnedd Ugain will take you on to meet the Llanberis Path to the summit of Snowdon. Heading down the steep, unstable scree slope of the Watkin Path before splitting off to Y Lliwedd and zigzagging through boulders and scree to the summit. A chance to look back on the route you have taken before heading down towards Llyn Llydaw and meeting the Miners Track. Chance to stretch your legs before arriving back at Pen y Pass.